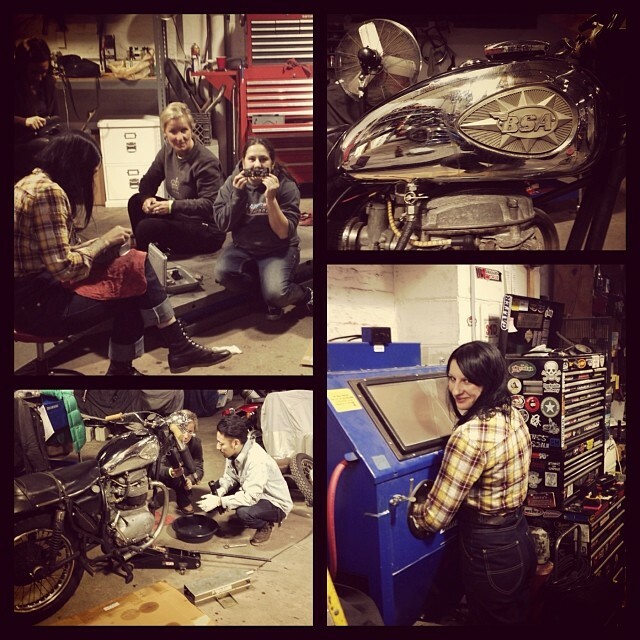 We recently did a quick one nighter session over at member Valerie’s garage MotorGrrl, on my 1968 BSA Lightning. The fork seals were leaking badly and it should have been a quick swap, but as with many old bikes and mine in particular, nothing is ever what it seems. I already knew that my ’68 Lightning has a ’70 Thunderbolt 650 engine in it, but i thought that was the only modification. Of course when we went to install stock, mail ordered ’68 A65 Lightning fork seals, we discovered that the Beezer has earlier A10 forks fitted to an A65 wheel. So…another week’s wait to get the right seals and I was back up and running. I love my franken-bike. Viva la vintage iron! This entry was posted in Motorcycles, Project bikes, Wrenching and tagged 1968 BSA Lightning, brooklyn, garage, garage night, moto mondays, motorgrrl, the miss-fires, the missfires, vintage motorcycle, vintage motorcycles, winter projects, wrenching. Bookmark the permalink. so let’s go– what can we do an when! It sometimes takes a bit of creativity to keep those Ol Brits rolling….lol Glad to see your taking the effort to keep that iron runnin! thank you, she’s my baby, and every ‘adventure’ is a pleasure!